The Bold Bagel: Kehinde Wiley: "Judith and Holofernes"
historical figures, events, and tales (such as the beheading of Holofernes by Judith) provides a powerful representation of the dark-skinned, urban men and women of today`s world. Through his use of vibrant colors, modernism, and essence of strength and power given to the individuals within his work, the work of Kehinde Wiley can certainly be considered unique and contemporary. Wiley`s representation of dark-skinned men and women provides his audience with insight to the various cultures and ethnicities throughout the world; those of which we are typically blind to. Wiley`s atypical approach of merging historical themes with a modern artistic style produces compelling pieces unlike that of any other artist. typical oil painting technique includes the painter sketching the piece with charcoal or a small amount of paint, and then painting with an oil-color pigment mix. Kehinde Wiley paints almost all of his pieces in oil. 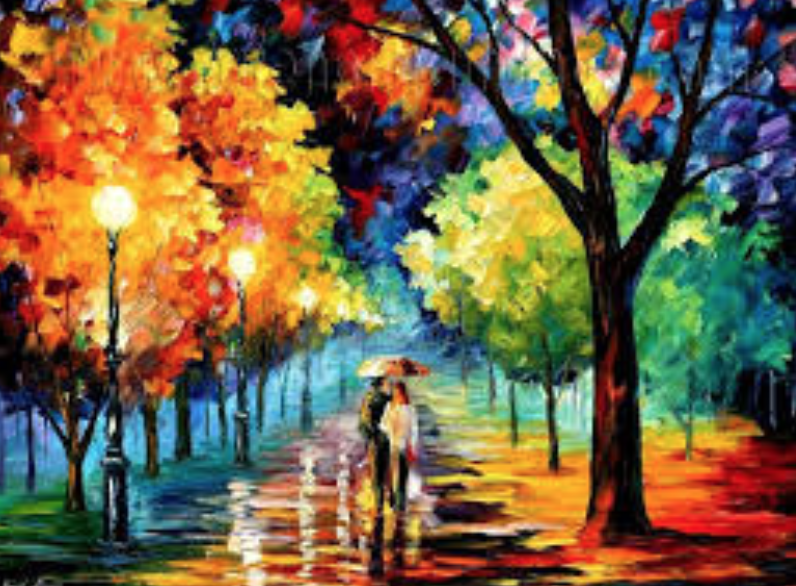 The oil can be combined with almost any pigment color, proving beneficial to artists whose art tends to be very colorful and vibrant. Wiley incorporates vivid floral backgrounds into all of his pieces. The use of oil paints establishes the notable boldness of each of these pieces. Kehinde Wiley is known for the vibrant colors used in his paintings; especially throughout the backgrounds. The colorfulness of Wiley`s pieces are what provide them with that spark of modernism. 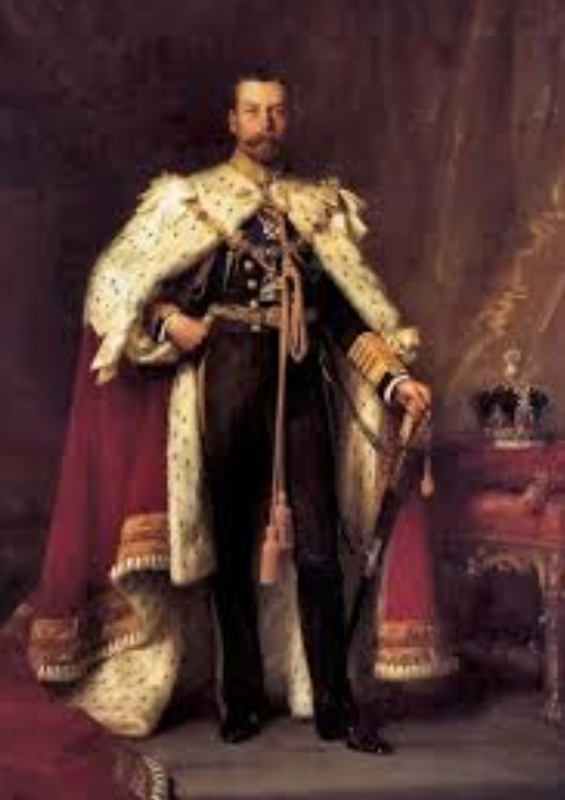 As stated, the inspiration for Wiley`s paintings is drawn from historical figures, events, and tales; ordinarily those regarding the European monarchy and the Renaissance. The average painting or sculpture from either of these time periods lacked bold coloring, and exemplified an elegant, dignified society. We tend not to associate “elegance” and “class” with bright, flashy colors; in both society and art. However, Wiley uses this stereotype to his advantage. Through his representation of the dark-skinned, urban men and women of today`s world, Wiley establishes a refined perception of modern-day elegance and class. Certain colors evoke particular feelings within the individual exposed to it. The colors themselves do not evoke the feelings, but it is the way we have been predisposed to these colors within society that causes us to respond to them in a particular manner (Talaei, 2013, p. 25). According to the Kuwait Chapter of the Arabian Journal of Business and Management Review, humans tend to have particular psychological reactions to colors they are subjected to. For example, the color red stimulates feelings of strength, determination, and passion. While the color blue stimulates feelings of calmness, conservatism, and peace. The most prevalent colors within Judith and Holofernes are black, green, and hints of blue tones. If this piece were to be viewed from a psychological standpoint, each of these colors would have a particular meaning; which in this case are reasonably accurate. The color black is representative of elegance, formality, power, and strength. Green can symbolize optimism and freshness, while tones of blue can represent power, royalty and honor (“The Meaning of Color”). Whether Wiley used these colors intentionally or unintentionally, clearly the feelings evoked by these colors are equivalent to the feelings evoked by the painting itself. Every artist seems to have their own “signature” incorporated into each of their pieces. The backgrounds of Wiley`s paintings are some form of a floral pattern full of color. Between his signature floral design and use of color, the work of Kehinde Wiley can easily be recognized and distinguished from any other artist. frightening and horrific. Wiley`s interpretation of the tale seems to do quite the opposite. Wiley`s painting is very modern, and the woman portraying Judith has a very strong, powerful look upon her face (rather than one full of fear). 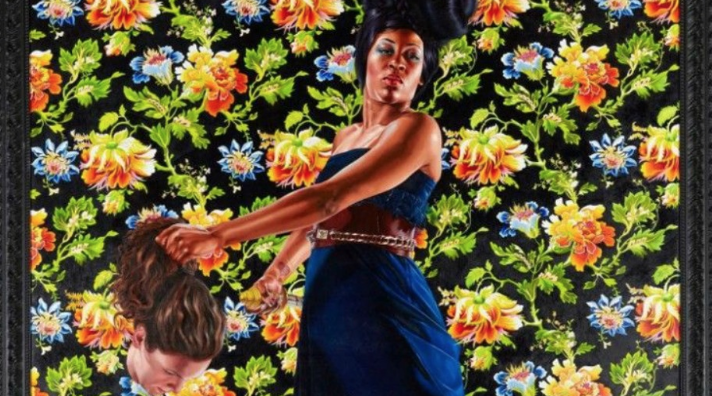 Only through the use of bold, vibrant colors, and such a powerful cultural subject matter could an artist accomplish portraying the beheading of another human being as “beautiful.” However, this incorporation of an old tale and modern elements throughout the painting is what makes Kehinde Wiley`s work unique. The similarly styled backgrounds present in each of Wiley`s paintings always provide somewhat of a “regal feel;” consisting of elegant patterns and/or floral patterns. Contrasting from these hints of elegance, the characters of Wiley`s pieces are painted wearing clothing very typical to present-day society. Judith and Holofernes takes the theme of an old tale, but includes a modern twist. The story of the beheading of Holofernes by Judith is from biblical times, however, Wiley paints his own version of Judith in very modern clothing and hairstyle. Some may even go as far as saying that the incorporation of dark-skinned individuals is “modern; particularly in the case of Judith and Holofernes. In past centuries, dark-skinned people were often not portrayed as powerful or noble. In fact, they tended to be exemplified as slaves or lower members of society. While the beauty may be in the eyes of the beholder, Kehinde Wiley`s unmistakable modern style is apparent to any critic. strong and grand. 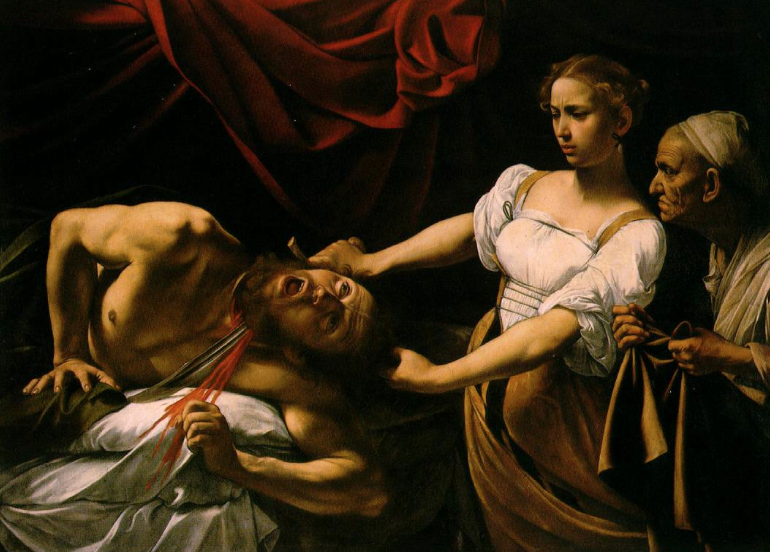 Wiley accomplishes this with the woman portraying Judith in Judith and Holofernes by painting her very robust, including a strong expression upon her face, and casually grasping a decapitated head of another woman. This is in contrast to many other pieces depicting the beheading of Holofernes by Judith, as they tend to portray Judith as very innocent and somewhat frightened preceding her heroic act. In regards to the physique and persona of his focal points, Wiley`s primary objective is not to just portray power and strength, but power and strength of dark-skinned, urban men and women of today`s world. Of course there are other artists that utilize vibrant colors, the style of modernism, and even portray their focal characters as strong and powerful. 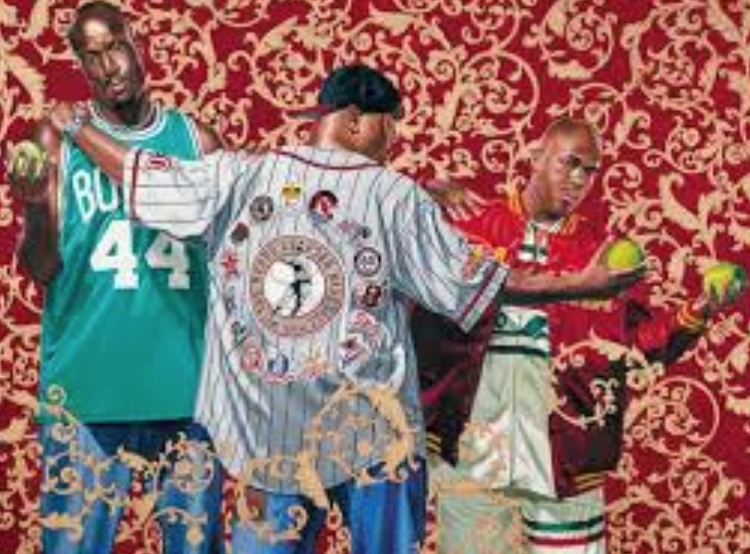 However, Kehinde Wiley differs from most artists by integrating these features with historical themes and contexts. Judith and Holofernes provides a contemporary, refreshing interpretation on what some may consider a gruesome biblical tale. Bold colors implement a positive, energetic essence to the piece, contrary to the story itself. The combination of the “old” with the “new,” historical themes integrated within modern elements, produces a one-of-a-kind piece open to subjective interpretation. The physique, body positioning, and facial expression of the woman portraying Judith depicts her as an individual of great strength; enhancing Wiley`s representation of the dark-skinned, urban men and women of today`s world. Together, these elements make Judith and Holofernes visually, historically, and culturally compelling. (2014, January 9). Violence and virtue: Artemisia gentileschi’s “judith slaying holofernes”. Retrieved from The Art Institute of Chicago website: www.artic.edu. Hammer-Tugendhat, D., & Zanchi, M. (2012). Art, sexuality, and gender constructions in western culture. Art in Translation, 4(3), 361-382. (n.d.). About. Retrieved from Kehinde Wiley website: kehindewiley.com. Talaei, M. (2013). Color, feeling and advertising. Kuwait Chapter of the Arabian Journal of Business and Management Review, 2(6), 25.
painting right. So sad...Everyone will laugh at him now.